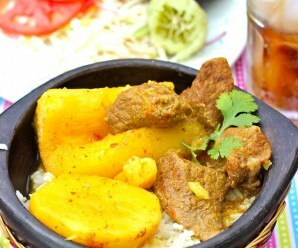 Sancocho is a traditional Colombian dish and is prepared many different ways throughout the country. You’ll find fish, peas, beef and chicken, pork and bean Sancocho in Colombia. 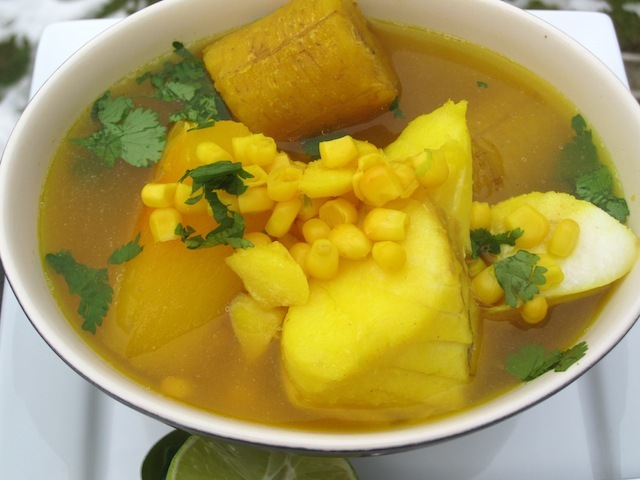 Sancocho is a soup made with plantain, yuca, potato, corn, and the meat of your choice, It is a hearty, comforting and delicious dish that is usually served with white rice , salad , aji, lime and avocado on the side. This Sancocho de Pescado is popular on the Coast of Colombia. In a large pot, over medium heat, place the olive oil, onions, scallions and garlic. Cook for 5 minutes. Add the fish stock, achiote, ground cumin and bring to a boil. Then reduce the heat to medium-low. Add the plantains, corn, yuca, salt and pepper. Simmer covered for about 25 to 30 minutes. Add the fish and chopped cilantro. Cook for 12 minutes and serve with white rice, lime and avocado on the side. This looks delicious! I love sancocho, but I have never thought of doing it with fish. Looks yummy! This for sharing such wonderful recipes. 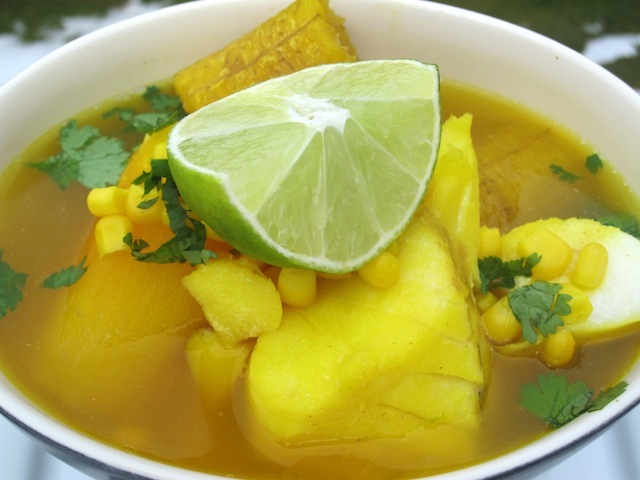 This sancocho is very popular in the north coast of Colombia. Great recipe Erika…I will definitely try it! 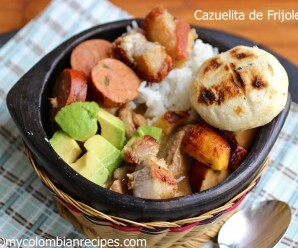 Yuca and plantains in a soup sound awesome! Soups in the Philippines are considered main courses, full of hearty ingredients and served with rice, but here it’s often seen as a starter or appetizer. Sancocho is just my kind of dish! This is so good. I have not had yuca in such a long time. Nice photo. 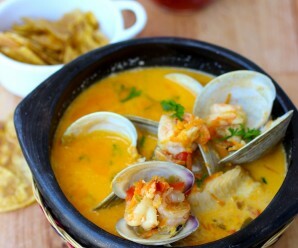 Loooooove sancocho, but never heard of a fish one, definitely have to try this one! yum! ah..such a light flavorful soup! YUM! I would LOVE this! This looks so warming and hearty…the perfect comfort food! I love the big, hearty pieces of veggies and fish! Looks wonderful and I cannot wait to give it a try! I hope you do not mind, but I just linked to it in my cumin post. I wanted to give an idea of the wonderful diversity of this spice and your recipe is the perfect addition! This looks nice and comforting! 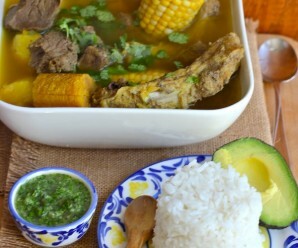 Thank you,Sancocho looks really yummy and i love Colombian food. It is a dish very delicious!!!! If you don’t have fish stock handy, make it by boiling a fish head in water with salt and mild condiments. Drain the head/bones and there you go! is a recipe that is prepared throughout Colombia, is rich and delicious and easy to prepare, i like corn ,Be encouraged to prepare. seeds, you will be suprise. TY for this recipe. Our sancocho came out delicious., we actually added a fish head which gave our sancocho a bit of a better flavor. Cheers.